I had so much fun working with this couple. They are truly special together and I was thrilled to create a number of different items for their October wedding. 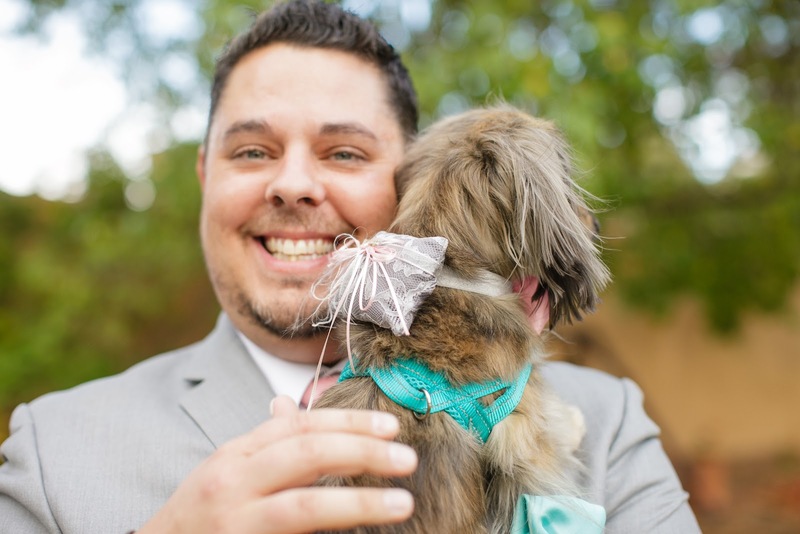 The first item was a ringbearer pillow for their dog, Thor. I love that name, especially for a 9 lb. dog! 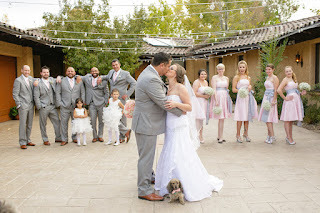 The bride, Tyler asked that I use the grey and pink colors of the wedding palette, and the tiffany blue accent color was the leash. So adorable. 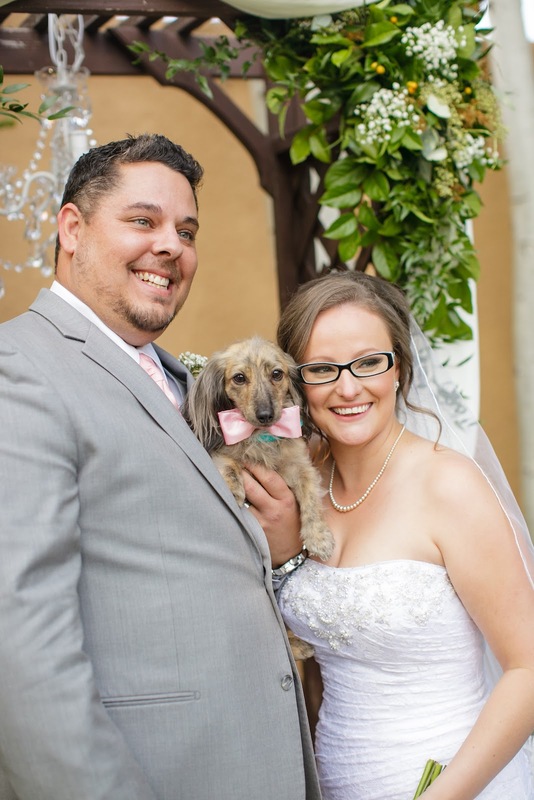 He was so well behaved during the wedding and as cute as can be! 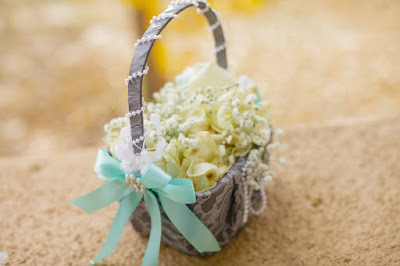 Next up was the vintage flower girl basket using the grey and tiffany blue color combination. So of course, vintage calls for plenty of lace and pearls. 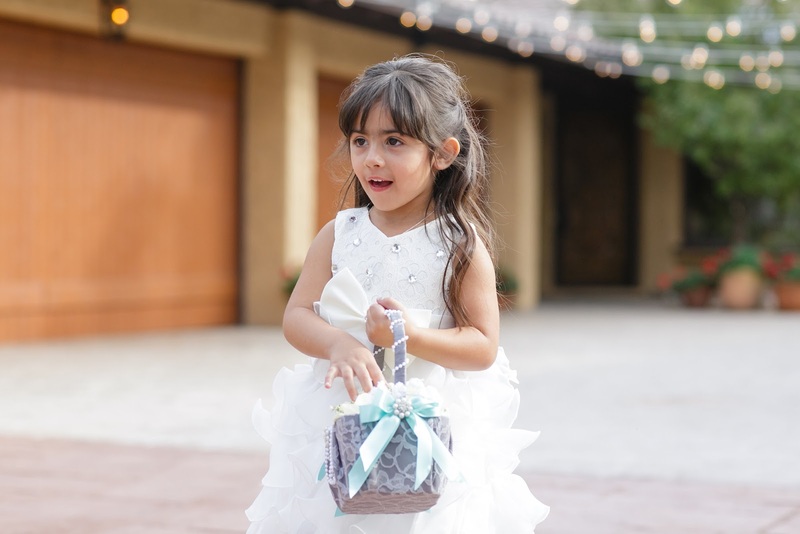 One of the two flower girls carried the basket, and the other walked Thor down the aisle. 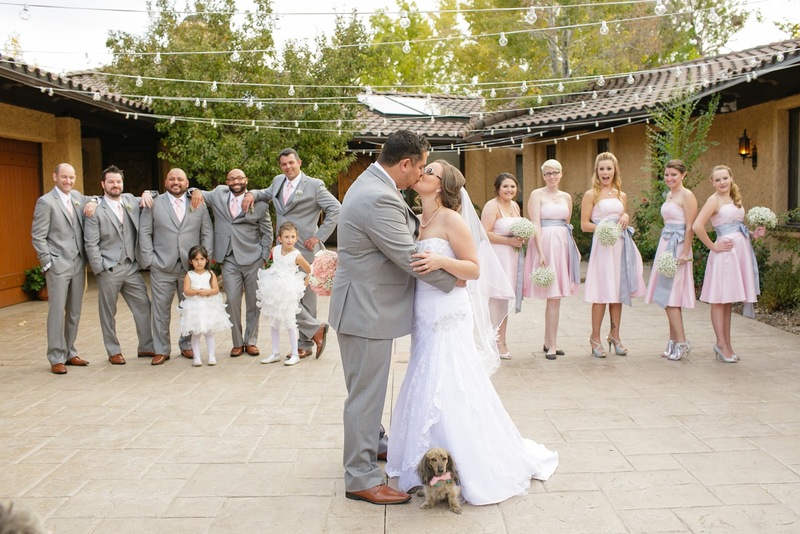 It was an absolutely beautiful fall day with temps in the '70's, so the outdoor ceremony was picture perfect. Finally, I made Tyler's wedding veil. 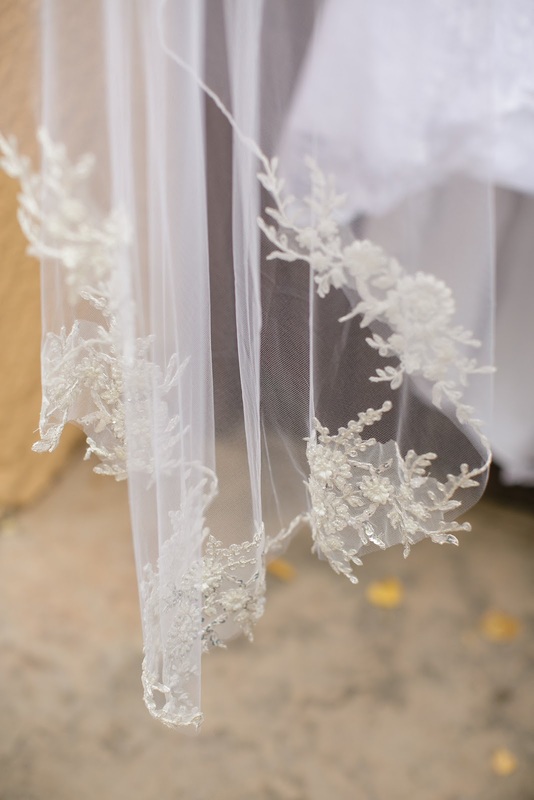 It is one of my favorites with appliques around the bottom of the veil that are a perfect match to the beading on the gown itself. I haven't made anything else like it before or since, so she truly has a one-of-a-kind! The fingertip length was the perfect look for the gown and the light gathering allowed for the beauty of the corset back to show through. 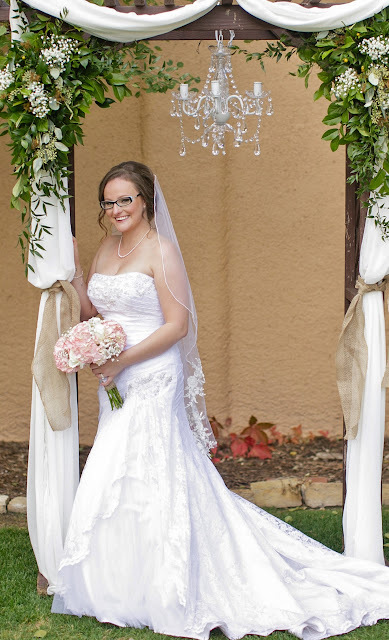 She looked beautiful! It's extra special when I'm also second shooting at the wedding since I can see all my pieces come together. I really have to work hard to get my daily allotment of veggies, so I'm always looking for tasty recipes. 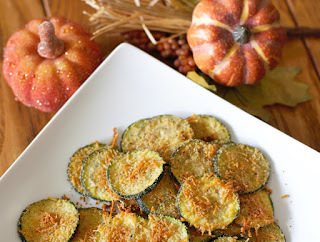 This recipe for zucchini chips caught my attention (probably because it had the word chip in it). They were easy to make and pretty dog gone tasty! Pre-heat oven to 450 degrees. Line a cookie sheet with parchment paper. 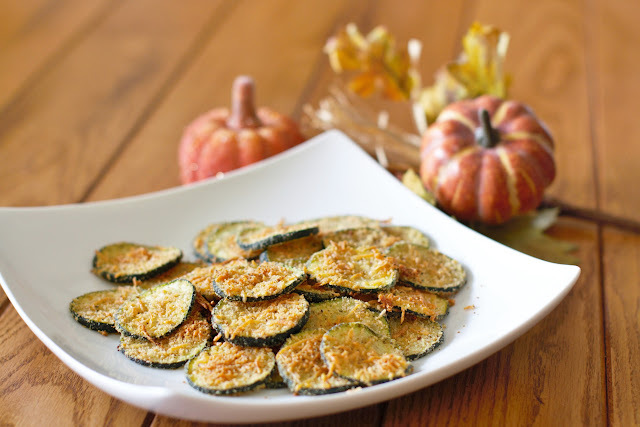 Slice zucchini into very thin slices; no more than ¼ inch thick. Place the oil in a large plastic bag. Add zucchini and toss to coat. In another bag, add the dry ingredients and mix by shaking well. Add in the coated zucchini and shake to cover the zucchini with the mixture. Lay zucchini on the cookie sheet. Be sure the zucchini are in a single layer on the pan. *I baked mine for 25 minutes since they were getting pretty brown. I found that mine were not completely crispy on the inside, but they were still tasty. I've since found other recipes that use a very low oven and bake for a longer time (225 degrees for 2 hours). I may have to try that method to see which style I prefer. I've made a number of drink coasters over the years, but that didn't stop me from trying my hand at another technique I saw recently. I had a number of aspen branch ovals leftover from when we had to take several of our mature aspens down in our backyard. 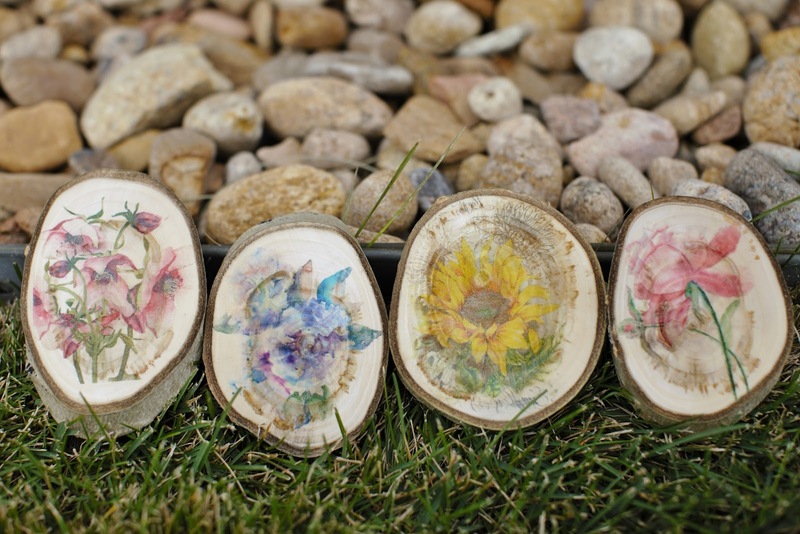 This project called for those ovals/circles and some pretty flower or botanical artwork. Since I've always loved art which uses watercolor as the pigment, I chose to find a variety of watercolor flower images online. Once I had those saved to my computer, I was ready to begin. The technique is really unique. You actually print the images on wax paper using your home printer! 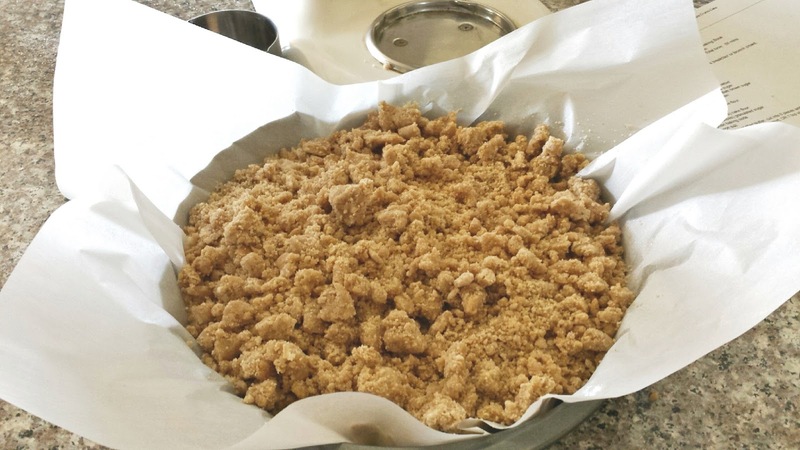 Cut the wax paper the width of your paper (8 ½"), and approximately one inch longer than the paper (12"). Wrap the extra inch over the top of the paper and use a piece of scotch tape to hold it to the backside. Feed the paper through your printer so the image prints on the wax paper. Be very careful when removing the paper from the printer and when cutting the images out. Dampen the wood circle with some water. I used a spray bottle to spritz the wood then rubbed it around with my finger to dampen the entire area. Carefully flip the image on top of the wood, ink side down. 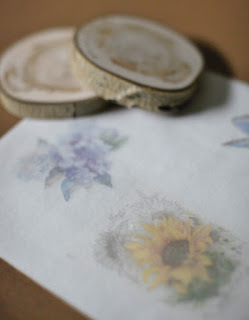 Hold the wax paper with one hand, and begin using the other hand to transfer the image to the wood; I used my index finger in a circular motion. The tutorial I reviewed used a credit card, to slide over the image....but I found that I didn't need that much pressure and by using my fingers I felt I had more control over the process. You'll definitely be able to see as it begins to transfer to the wood. Gently remove the wax paper and let the coasters dry for about couple of hours. I chose to add a top coat of Mod Podge on mine. Using a sponge brush lightly coat the entire surface all the way to the edges. I like the added protection that it offers, especially for a coaster. Then I added cork to the bottoms. I had some leftover cork from a previous project. 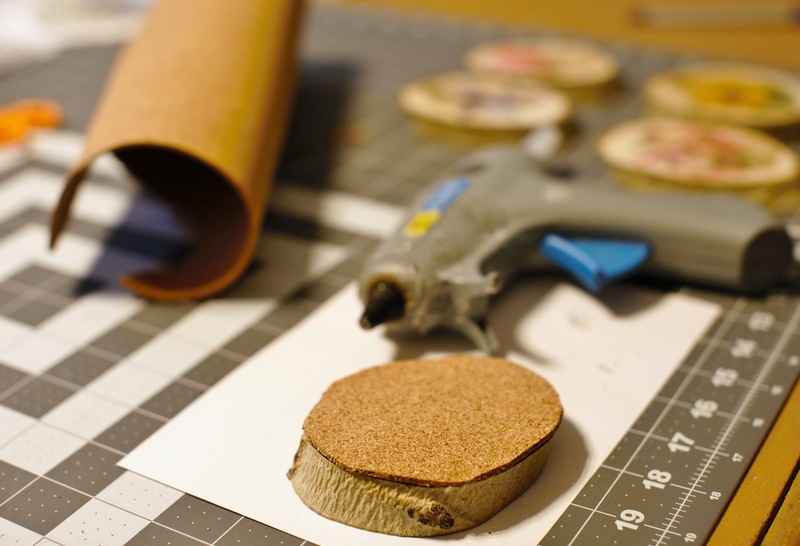 It came in a roll, so I traced the coasters, cut them out and hot glued them to the bottoms. 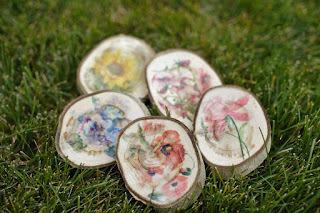 I've also used felt for this process, or even just felt or cork circles. They all work great....but definitely take the time to add something to the bottom to keep them from scratching other surfaces. I think they look so pretty! Floral images on the wood is the perfect organic touch. Now if you don't have any circles like I did, you can find them at many of the big box hobby stores, or even online. Now that I've seen how they look. I'm thinking I may try a larger version and use it for wall art. I'm going to keep my eyes peeled for just the right image! I really enjoyed working on this project. This bride was the third sister of a three sister family, and I've had the pleasure of working with each one of them for their wedding day. 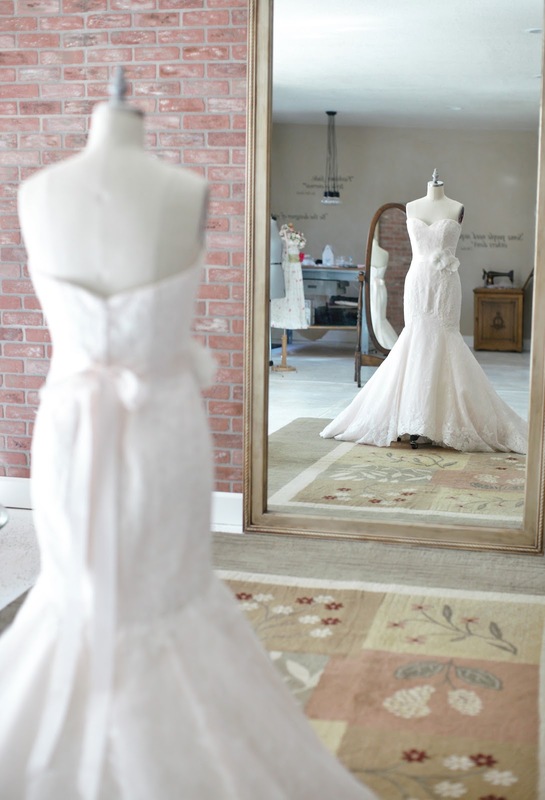 Lacey found herself a gorgeous lace overlay gown with a blush pink underlayer. The color made it so unique and she looked absolutely beautiful in it! She originally came to me to assist with hemming and the bustle. Once we finished with those items, I asked whether she had considered adding a sash. She said she was thinking about it, but hadn't found anything that she felt looked right. 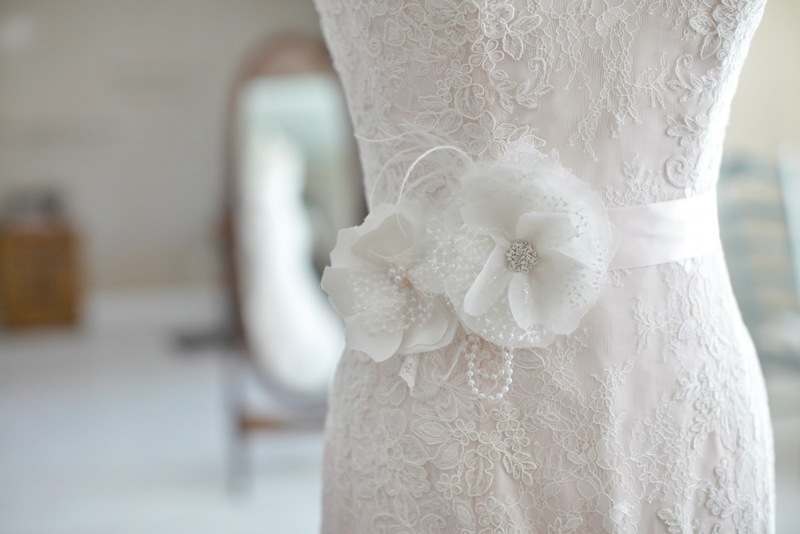 The first sash that came to mind was one I had made with handmade chiffon flowers. I thought it would really compliment the gown. 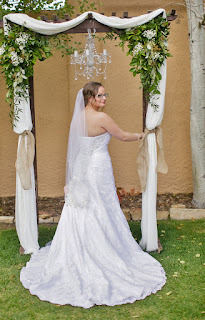 It was very light, romantic, and unique...just like the gown. She tried it on along with a few other sashes that I had on hand, but without a doubt, this one was the "hands down" favorite. I made her sash using the design elements from the sample that she tried on, although I customized it to make hers a true one-of-a-kind. Because I had some lace scraps available after hemming her gown, I added lace leaf accents, and found blush beads for the center of the smaller flower. A few ostrich feathers, and a pearl swag and it was just right! 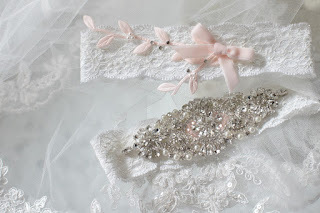 I had ordered the satin ribbon online and had my fingers and toes crossed until it arrived that their version of blush would be the right match for the gown. I think I may have squealed when I opened the box since it was the exact color of the gown! 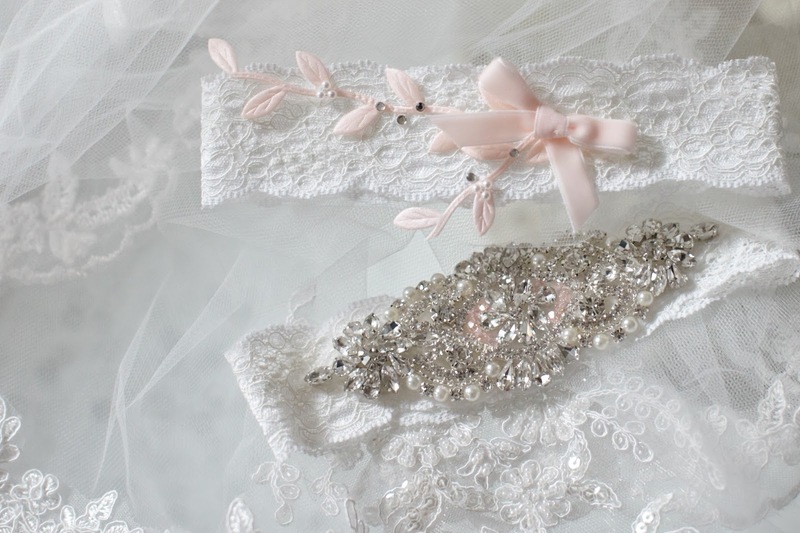 I also made Lacey a garter set, again pulling in touches of the blush color palette. I wish I would have thought to take a picture or two of the bustle. It was really pretty with eight bustle points around the seam just below the zipper. Oh boy! When I landed on this recipe, I knew I needed to try it. A good crumb cake is loaded with great crumb topping and this one delivers. Great flavor and lick the plate quality topping....really, I licked the plate to get every morsel! Note: This recipe calls for cake flour. 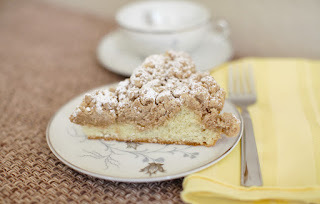 Be sure to use it versus all-pupose flour it makes all the difference in the texture of the cake. All purpose flour will make a dry and tough cake. Adjust oven rack to upper-middle position and pre-heat oven to 325 degrees. Make a sling of foil or parchment in an 8x8 pan and spray with non-stick cooking spray. Whisk melted butter, sugars, cinnamon and salt. Break up any large pieces. Slowly add flour while gently mixing together. The mixture will look like a stiff dough, set aside to cool. In a stand mixer with paddle attachment combine flour, sugar, baking soda and salt. With mixer running slowly add 1 Tbsp. of butter at a time. Continue beating until mixture resembles moist crumbs, with no chunks of butter. About 1-2 minutes. Slowly add buttermilk, egg, egg yolk and vanilla. Beat on medium-high until the batter is light and fluffy, about 1 minute. Pour batter into prepared baking pan, and spread evenly with rubber spatula. Tap pan on the countertop to minimize air bubbles before adding the topping. Break crumb topping into pea size pieces and spread in an even layer over batter beginning around the edges and working towards the center. Do not push the crumbs into the batter. Bake for 35-40 minutes, rotating pan once halfway through the cooking time. Crumbs will be golden, and a toothpick should come out clean when inserted in the middle. Let cool on wire rack for at least 30 minutes. Remove cake from pan by lifting sling. Dust lightly with powdered sugar before serving. 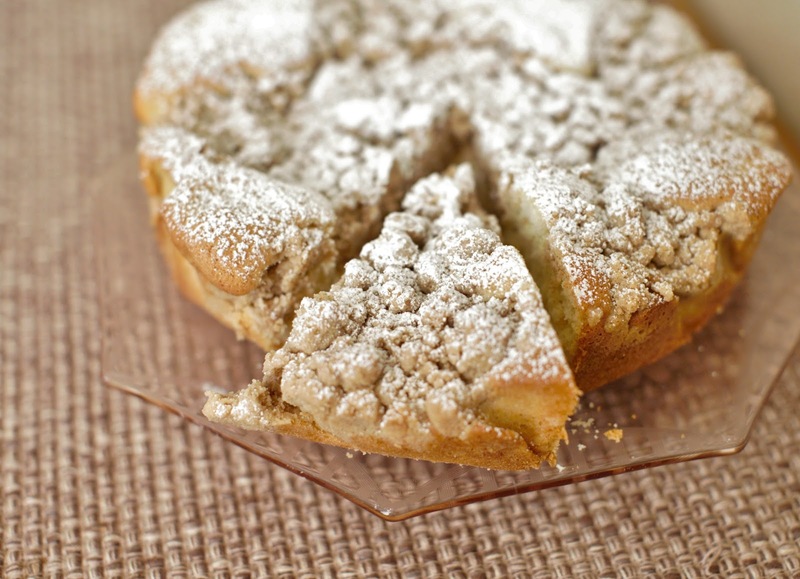 By doubling the recipe you can make this in a 13 x 9 inch pan. If doubling, increase the baking time to about 45 minutes.